SolarWorks! 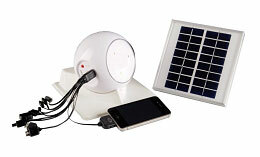 newest product, the Solar Kit Lithium,was recently tested, and met the Lighting Global Quality Standards.This portable solar light offers three brightness levels and a USB cable with connectors for charging up to 10 different mobile phones or other devices. The Solar Kit Lithium provides over 7 hours of bright light after a single day of solar charging,or can last for over 40 hours on the lowest setting. The Solar Kit Lithium may seem familiar as it is a new and improved version of the company’s original product, the Solar Kit, which met the Lighting Global Quality Standards in 2011. SolarWorks! founders Bernard Hulshof and Arnoud de Vroomen first developed the product under the company name Flynn Solar. The company was then purchased by Lemnis Lighting, which later became NTL-Lemnis. After the merger with NTL Electronics, the founders bought back the solar business and formed SolarWorks! SolarWorks! currently distributes products in 14 countries in Africa and five countries in Europe, and is poised to expand to other markets.